Four standard expansion connectors allow designs to grow beyond the Basys2 board using breadboards, user-designed circuit boards, or Pmods (Pmods are inexpensive analog and digital I/O modules that offer A/D & D/A conversion, motor drivers, sensor inputs, and many other features). Signals on the 6-pin connectors are protected against ESD damage and short-circuits, ensuring a long operating life in any environment. The Basys2 board works seamlessly with all versions of the Xilinx ISE tools, including the free WebPack. It ships with a USB cable that provides power and a programming interface, so no other power supplies or programming cables are required. The Basys2 board can draw power and be programmed via its on-board USB2 port. 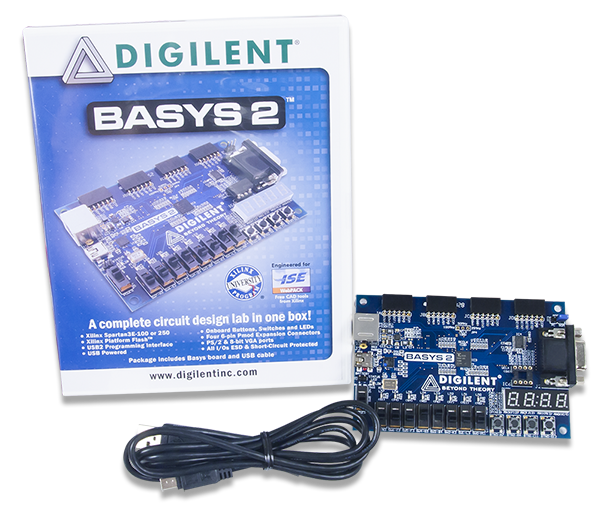 Digilent’s freely available PC-based Adept software automatically detects the Basys2 board, provides a programming interface for the FPGA and Platform Flash ROM, and allows user data transfers (see www.digilentinc.com for more information). The Basys2 board is designed to work with the free ISE WebPack CAD software from Xilinx. WebPack can be used to define circuits using schematics or HDLs, to simulate and synthesize circuits, and to create programming files. Webpack can be downloaded free of charge from www.xilinx.com/ise/. The Basys2 board ships with a built-in self-test/demo stored in its ROM that can be used to test all board features. To run the test, set the Mode Jumper (see below) to ROM and apply board power. If the test is erased from the ROM, it can be downloaded and reinstalled at any time. See www.digilentinc.com/Basys2 for the test project as well as further documentation, reference designs, and tutorials. The Basys2 board is typically powered from a USB cable, but a battery connector is also provided so that external supplies can be used. To use USB power, simply attach the USB cable. To power the Basys2 using a battery or other external source, attach a 3.5V-5.5V battery pack (or other power source) to the 2-pin, 100-mil spaced battery connector (three AA cells in series make a good 4.5+/- volt supply). Voltages higher than 5.5V on either power connector may cause permanent damage. Input power is routed through the power switch (SW8) to the four 6-pin expansion connectors and to a Linear Technology LTC3545 voltage regulator. The LTC3545 produces the main 3.3V supply for the board, and it also produces 2.5V and 1.2V supply voltages required by the FPGA. Total board current is dependent on FPGA configuration, clock frequency, and external connections. In test circuits with roughly 20K gates routed, a 50MHz clock source, and all LEDs illuminated, about 100mA of current is drawn from the 1.2V supply, 50mA from the 2.5V supply, and 50mA from the 3.3V supply. Required current will increase if larger circuits are configured in the FPGA, or if peripheral boards are attached. 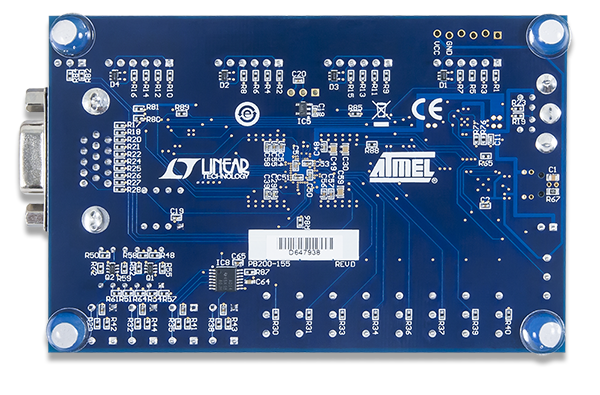 The Basys2 board uses a four layer PCB, with the inner layers dedicated to VCC and GND planes. The FPGA and the other ICs on the board have large complements of ceramic bypass capacitors placed as close as possible to each VCC pin, resulting in a very clean, low-noise power supply. 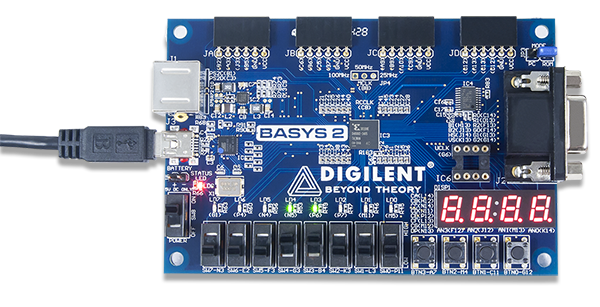 After power-on, the FPGA on the Basys2 board must be configured before it can perform any useful functions. During configuration, a “bit” file is transferred into memory cells within the FPGA to define the logical functions and circuit interconnects. The free ISE/WebPack CAD software from Xilinx can be used to create bit files from VHDL, Verilog, or schematic-based source files. Digilent’s PC-based program called Adept can be used to configure the FPGA with any suitable bit file stored on the computer. Adept uses the USB cable to transfer a selected bit file from the PC to the FPGA (via the FPGA’s JTAG programming port). Adept can also program a bit file into an on-board non-volatile ROM called “Platform Flash”. Once programmed, the Platform Flash can automatically transfer a stored bit file to the FPGA at a subsequent power-on or reset event if the Mode Jumper (JP3) is set to ROM. The FPGA will remain configured until it is reset by a power-cycle event. The Platform Flash ROM will retain a bit file until it is reprogrammed, regardless of power-cycle events. To program the Basys2 board, set the mode jumper to PC and attach the USB cable to the board. Start the Adept software, and wait for the FPGA and the Platform Flash ROM to be recognized. Use the browse function to associate the desired .bit file with the FPGA, and/or the desired .mcs file with the Platform Flash ROM. Right-click on the device to be programmed, and select the “program” function. The configuration file will be sent to the FPGA or Platform Flash, and the software will indicate whether programming was successful. The “Status LED” LED (LD_8) will also blink after the FPGA has been successfully configured. For further information on using Adept, please see the Adept documentation available at the Digilent website. 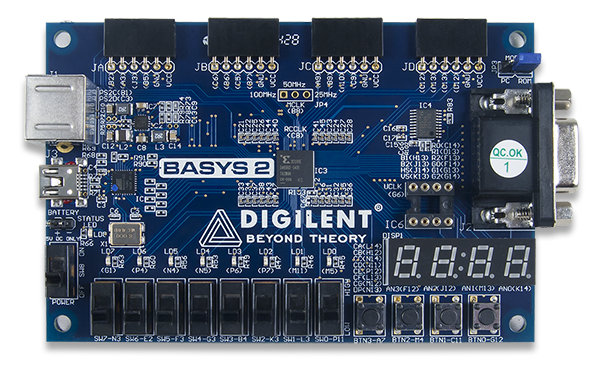 The Basys2 board includes a primary, user-settable silicon oscillator that produces 25MHz, 50MHz, or 100MHz based on the position of the clock select jumper at JP4. Initially, this jumper is not loaded and must be soldered in place. A socket for a second oscillator is provided at IC6 (the IC6 socket can accommodate any 3.3V CMOS oscillator in a half-size DIP package). The primary and secondary oscillators are connected to global clock input pins at pin B8 and pin M6 respectively. Both clock inputs can drive the clock synthesizer DLL on the Spartan 3E, allowing for a wide range if internal frequencies, from 4 times the input frequency to any integer divisor of the input frequency. The primary silicon oscillator is flexible and inexpensive, but it lacks the frequency stability of a crystal oscillator. Some circuits that drive a VGA monitor may realize a slight improvement in image stability by using a crystal oscillator installed in the IC6 socket. For these applications, a 25MHz (or 50MHz) crystal oscillator, available from any catalog distributor, is recommended (see for example part number SG-8002JF-PCC at www.digikey.com ). Four pushbuttons and eight slide switches are provided for circuit inputs. Pushbutton inputs are normally low and driven high only when the pushbutton is pressed. Slide switches generate constant high or low inputs depending on position. Pushbuttons and slide switches all have series resistors for protection against short circuits (a short circuit would occur if an FPGA pin assigned to a pushbutton or slide switch was inadvertently defined as an output). Eight LEDs and a four-digit seven-segment LED display are provided for circuit outputs. LED anodes are driven from the FPGA via current-limiting resistors, so they will illuminate when a logic '1' is written to the corresponding FPGA pin. A ninth LED is provided as a power-indicator LED, and a tenth LED (LD-D) illuminates any time the FPGA has been successfully programmed. Each of the four digits of the seven-segment LED display is composed of sevel LED segments arranged in a “figure 8” pattern. Segment LEDs can be individually illuminated, so any one of 128 patterns can be displayed on a digit by illuminating certain LED segments and leaving the others dark. Of these 128 possible patterns, the ten corresponding to the decimal digits are the most useful. The anodes of the seven LEDs forming each digit are tied together into one common anode circuit node, but the LED cathodes remain separate. The common anode signals are available as four “digit enable” input signals to the 4-digit display. The cathodes of similar segments on all four displays are connected into seven circuit nodes labeled CA through CG (so, for example, the four “D” cathodes from the four digits are grouped together into a single circuit node called “CD”). These seven cathode signals are available as inputs to the 4-digit display. This signal connection scheme creates a multiplexed display, where the cathode signals are common to all digits but they can only illuminate the segments of the digit whose corresponding anode signal is asserted. A scanning display controller circuit can be used to show a four-digit number on this display. This circuit drives the anode signals and corresponding cathode patterns of each digit in a repeating, continuous succession, at an update rate that is faster than the human eye response. Each digit is illuminated just one-quarter of the time, but because the eye cannot perceive the darkening of a digit before it is illuminated again, the digit appears continuously illuminated. If the update or “refresh” rate is slowed to a given point (around 45 hertz), then most people will begin to see the display flicker. For each of the four digits to appear bright and continuously illuminated, all four digits should be driven once every 1 to 16ms (for a refresh frequency of 1KHz to 60Hz). For example, in a 60Hz refresh scheme, the entire display would be refreshed once every 16ms, and each digit would be illuminated for ¼ of the refresh cycle, or 4ms. The controller must assure that the correct cathode pattern is present when the corresponding anode signal is driven. To illustrate the process, if AN1 is asserted while CB and CC are asserted, then a “1” will be displayed in digit position 1. Then, if AN2 is asserted while CA, CB and CC are asserted, then a “7” will be displayed in digit position 2. If A1 and CB, CC are driven for 4ms, and then A2 and CA, CB, CC are driven for 4ms in an endless succession, the display will show “17” in the first two digits. Figure 8 shows an example timing diagram for a four-digit seven-segment controller. The 6-pin mini-DIN connector can accommodate a PS/2 mouse or keyboard. The PS/2 connector is supplied with 5VDC. Both the mouse and keyboard use a two-wire serial bus (clock and data) to communicate with a host device. Both use 11-bit words that include a start, stop and odd parity bit, but the data packets are organized differently, and the keyboard interface allows bi-directional data transfers (so the host device can illuminate state LEDs on the keyboard). Bus timings are shown in the figure. The clock and data signals are only driven when data transfers occur, and otherwise they are held in the “idle” state at logic ‘1’. The timings define signal requirements for mouse-to-host communications and bi-directional keyboard communications. A PS/2 interface circuit can be implemented in the FPGA to create a keyboard or mouse interface. The keyboard uses open-collector drivers so the keyboard or an attached host device can drive the two-wire bus (if the host device will not send data to the keyboard, then the host can use input-only ports). PS2-style keyboards use scan codes to communicate key press data. Each key is assigned a code that is sent whenever the key is pressed; if the key is held down, the scan code will be sent repeatedly about once every 100ms. When a key is released, a “F0” key-up code is sent, followed by the scan code of the released key. If a key can be “shifted” to produce a new character (like a capital letter), then a shift character is sent in addition to the scan code, and the host must determine which ASCII character to use. Some keys, called extended keys, send an “E0” ahead of the scan code (and they may send more than one scan code). When an extended key is released, an “E0 F0” key-up code is sent, followed by the scan code. Scan codes for most keys are shown in the figure. A host device can also send data to the keyboard. Below is a short list of some common commands a host might send. ED Set Num Lock, Caps Lock, and Scroll Lock LEDs. Keyboard returns “FA” after receiving “ED”, then host sends a byte to set LED status: Bit 0 sets Scroll Lock; bit 1 sets Num Lock; and Bit 2 sets Caps lock. Bits 3 to 7 are ignored. EE Echo (test). Keyboard returns “EE” after receiving “EE”. F3 Set scan code repeat rate. Keyboard returns “F3” on receiving “FA”, then host sends second byte to set the repeat rate. FE Resend. “FE” directs keyboard to re-send most recent scan code. FF Reset. Resets the keyboard. The keyboard can send data to the host only when both the data and clock lines are high (or idle). Since the host is the “bus master”, the keyboard must check to see whether the host is sending data before driving the bus. To facilitate this, the clock line is used as a “clear to send” signal. If the host pulls the clock line low, the keyboard must not send any data until the clock is released. The keyboard sends data to the host in 11-bit words that contain a ‘0’ start bit, followed by 8-bits of scan code (LSB first), followed by an odd parity bit and terminated with a ‘1’ stop bit. The keyboard generates 11 clock transitions (at around 20 - 30KHz) when the data is sent, and data is valid on the falling edge of the clock. The mouse outputs a clock and data signal when it is moved; otherwise, these signals remain at logic ‘1’. Each time the mouse is moved, three 11-bit words are sent from the mouse to the host device. Each of the 11-bit words contains a ‘0’ start bit, followed by 8 bits of data (LSB first), followed by an odd parity bit, and terminated with a ‘1’ stop bit. Thus, each data transmission contains 33 bits, where bits 0, 11, and 22 are ‘0’ start bits, and bits 11, 21, and 33 are ‘1’ stop bits. The three 8-bit data fields contain movement data as shown in the figure above. Data is valid at the falling edge of the clock, and the clock period is 20 to 30KHz. The mouse assumes a relative coordinate system wherein moving the mouse to the right generates a positive number in the X field, and moving to the left generates a negative number. Likewise, moving the mouse up generates a positive number in the Y field, and moving down represents a negative number (the XS and YS bits in the status byte are the sign bits – a ‘1’ indicates a negative number). The magnitude of the X and Y numbers represent the rate of mouse movement – the larger the number, the faster the mouse is moving (the XV and YV bits in the status byte are movement overflow indicators – a ‘1’ means overflow has occurred). If the mouse moves continuously, the 33-bit transmissions are repeated every 50ms or so. The L and R fields in the status byte indicate Left and Right button presses (a ‘1’ indicates the button is being pressed). The Basys2 board uses 10 FPGA signals to create a VGA port with 8-bit color and the two standard sync signals (HS – Horizontal Sync, and VS – Vertical Sync). The color signals use resistor-divider circuits that work in conjunction with the 75-ohm termination resistance of the VGA display to create eight signal levels on the red and green VGA signals, and four on blue (the human eye is less sensitive to blue levels). This circuit, shown in figure 13, produces video color signals that proceed in equal increments between 0V (fully off) and 0.7V (fully on). A video controller circuit must be created in the FPGA to drive the sync and color signals with the correct timing in order to produce a working display system. VGA signal timings are specified, published, copyrighted and sold by the VESA organization (www.vesa.org). The following VGA system timing information is provided as an example of how a VGA monitor might be driven in 640 by 480 mode. For more precise information, or for information on other VGA frequencies, refer to documentation available at the VESA website. CRT-based VGA displays use amplitude-modulated moving electron beams (or cathode rays) to display information on a phosphor-coated screen. LCD displays use an array of switches that can impose a voltage across a small amount of liquid crystal, thereby changing light permittivity through the crystal on a pixel-by-pixel basis. Although the following description is limited to CRT displays, LCD displays have evolved to use the same signal timings as CRT displays (so the “signals” discussion below pertains to both CRTs and LCDs). Color CRT displays use three electron beams (one for red, one for blue, and one for green) to energize the phosphor that coats the inner side of the display end of a cathode ray tube (see illustration). Electron beams emanate from “electron guns” which are finely-pointed heated cathodes placed in close proximity to a positively charged annular plate called a “grid”. The electrostatic force imposed by the grid pulls rays of energized electrons from the cathodes, and those rays are fed by the current that flows into the cathodes. These particle rays are initially accelerated towards the grid, but they soon fall under the influence of the much larger electrostatic force that results from the entire phosphor-coated display surface of the CRT being charged to 20kV (or more). The rays are focused to a fine beam as they pass through the center of the grids, and then they accelerate to impact on the phosphor-coated display surface. The phosphor surface glows brightly at the impact point, and it continues to glow for several hundred microseconds after the beam is removed. The larger the current fed into the cathode, the brighter the phosphor will glow. Between the grid and the display surface, the beam passes through the neck of the CRT where two coils of wire produce orthogonal electromagnetic fields. Because cathode rays are composed of charged particles (electrons), they can be deflected by these magnetic fields. Current waveforms are passed through the coils to produce magnetic fields that interact with the cathode rays and cause them to transverse the display surface in a “raster” pattern, horizontally from left to right and vertically from top to bottom. As the cathode ray moves over the surface of the display, the current sent to the electron guns can be increased or decreased to change the brightness of the display at the cathode ray impact point. Information is only displayed when the beam is moving in the “forward” direction (left to right and top to bottom), and not during the time the beam is reset back to the left or top edge of the display. Much of the potential display time is therefore lost in “blanking” periods when the beam is reset and stabilized to begin a new horizontal or vertical display pass. The size of the beams, the frequency at which the beam can be traced across the display, and the frequency at which the electron beam can be modulated determine the display resolution. Modern VGA displays can accommodate different resolutions, and a VGA controller circuit dictates the resolution by producing timing signals to control the raster patterns. The controller must produce synchronizing pulses at 3.3V (or 5V) to set the frequency at which current flows through the deflection coils, and it must ensure that video data is applied to the electron guns at the correct time. Raster video displays define a number of “rows” that corresponds to the number of horizontal passes the cathode makes over the display area, and a number of “columns” that corresponds to an area on each row that is assigned to one “picture element” or pixel. Typical displays use from 240 to 1200 rows and from 320 to 1600 columns. The overall size of a display and the number of rows and columns determines the size of each pixel. Video data typically comes from a video refresh memory, with one or more bytes assigned to each pixel location (the Basys2 uses three bits per pixel). The controller must index into video memory as the beams move across the display, and retrieve and apply video data to the display at precisely the time the electron beam is moving across a given pixel. A VGA controller circuit must generate the HS and VS timings signals and coordinate the delivery of video data based on the pixel clock. The pixel clock defines the time available to display one pixel of information. The VS signal defines the “refresh” frequency of the display, or the frequency at which all information on the display is redrawn. The minimum refresh frequency is a function of the display’s phosphor and electron beam intensity, with practical refresh frequencies falling in the 50Hz to 120Hz range. The number of lines to be displayed at a given refresh frequency defines the horizontal “retrace” frequency. For a 640-pixel by 480-row display using a 25MHz pixel clock and 60 +/-1Hz refresh, the signal timings shown in the table at right can be derived. Timings for sync pulse width and front and back porch intervals (porch intervals are the pre- and post-sync pulse times during which information cannot be displayed) are based on observations taken from actual VGA displays. A VGA controller circuit decodes the output of a horizontal-sync counter driven by the pixel clock to generate HS signal timings. This counter can be used to locate any pixel location on a given row. Likewise, the output of a vertical-sync counter that increments with each HS pulse can be used to generate VS signal timings, and this counter can be used to locate any given row. These two continually running counters can be used to form an address into video RAM. No time relationship between the onset of the HS pulse and the onset of the VS pulse is specified, so the designer can arrange the counters to easily form video RAM addresses, or to minimize decoding logic for sync pulse generation. The Basys2 board provides four 6-pin peripheral module ports. Each port provides Vdd, GND, and four unique FPGA signals. 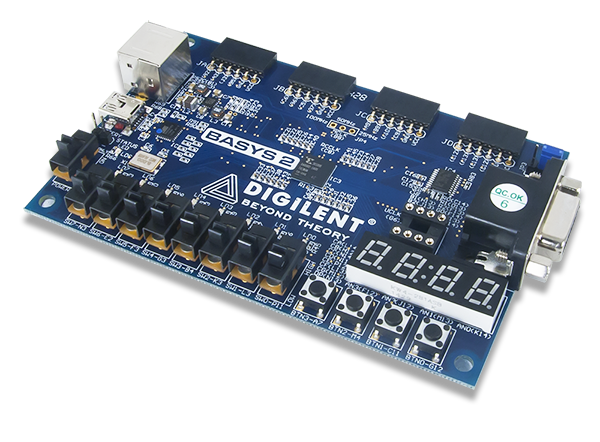 Several 6-pin module boards that can attach to this port are available from Digilent, including A/D converters, speaker amplifiers, microphones, H-bridge amplifiers, etc. Please see www.digilentinc.com for more information. The Basys2 board comes preloaded with a simple self test/demonstration project stored in its ROM. The demo project (available at the website) shows how the Xilinx CAD tools connect FPGA signals to Basys2 circuits. Since the project is stored in ROM, it can also be used to check board functions. To run the demo, set the ROM/USB jumper (JP3) to ROM and apply power to the board; the seven-segment display will show counting digits, the switches will turn on individual LEDs, the buttons will turn off individual digits on the seven segment display, and a test pattern is driven on the VGA port. If the self test is not resident in the Platform Flash ROM, it can be programmed into the FPGA or reloaded into the ROM using the Adept programming software.